Fall is here and with it apples, pears and quince, some of my favorite fruits. With summer fruits waning we welcome the fall harvest announcing a new season of preserving. Few fruits lend themselves to canning as well as the pear. It’s delicate taste and firm texture make it a perfect canvas for a variety of flavors. This recipe preserves the pears subtle almost floral flavor. Adding a few peppercorns and the brandy to each jar provides a barely perceivable counterbalance to the the sweetness of the sugar syrup, making it a bit more refined than your average canned pear. Wonderfully versatile this recipe can be used in any number of dessert preparations.Having a few jars of these on hand allows you to whip up a glamorous dessert in a nanosecond.With the holidays around the corner that's a Godsend. Mix the water and citric acid or lemon juice together in a large bowl. Peel, halve and core the pears (I use a melon baller) and place them in the water mixture to prevent browning. Place pears in a single layer (you may have to do two batches) in syrup. Cook over medium low heat for 5 minutes until fruit is heated through. Put six peppercorns and I - 2 tablespoons of the Pear William or brandy in the bottom of the hot sterilized jars. Using tongs or a slotted spoon pack pears into jars as snugly as possible (the fruit shrinks while cooking). Fill to the top squeezing in an extra half pear if possible. Fish out the vanilla bean and cut into 4 pieces, tucking a piece into each jar. Cover the pears with the sugar syrup leaving 1/2 inch headroom. Remove any air bubbles. Wipe rims and place lids on screwing on lightly. Place jars in canner covering with more hot water to submerge the jars. Bring to a boil and process for 25 minutes (timed from the boil). Process pints for 20 minutes. Remove lid and wait 5 minutes before carefully removing jars. Place jars on towels or a cutting board . Let cool undisturbed for 24 hours. Don't be afraid, this sounds far more complicated than it really is. Once you have the technique down you can riff on the flavors and apply it to other fruits. While I prefer the look of wide-mouth jars, canned fruits or tomatoes fare better in the regular jars as the small opening helps keep the fruit submerged. With the wide mouth jars the fruit rises up to the top sometimes leaving you with an inch or two of liquid on the bottom of the jar, which while it does not affect the fruit, it does not look quite right. Mmmm. This sounds good. I just did a drunken version of pears in lots and lots of brandy. Without the brandy, I prefer star anise. Delish! I made this last Saturday, and have already given some away as X-mas gifts. Boy, is it delicious! Wish I could do more today, but have to work. I think I will try a variation next weekend. Maybe something with mint and triple sec. Any suggestions? Nina, I was examining some of the pears I made, and some of them are turning brown, especially where I scooped out the core with a melon baller. They taste fine, just aren't too pretty. Any ideas about why this is? Maybe I didn't use enough lemon juice in the anit-browning water soak? I also might have used too much brandy, as I added 1/3C to the syrup, instead of adding it to each jar. It is very brandy-y, which is ok, but I would prefer it to be more subtle. Well lets see, it could be a few things. A.Could be a bad seal, check the seals on all your jars. B.Insufficient acid before canning. But I think you would have noticed it before placing the fruit in the jars. Although this doesn't look perfect, the fruit will still taste ok,but I know how disappointing it is when you want to gift them.You can always throw them into a bread pudding or something. C.Is the brown in the core area? If so it may be that you did not remove all of the core. I have had this happen when I did not remove the stringy part above the core.The brown will not spread from that area. D.What kind of pear did you use? 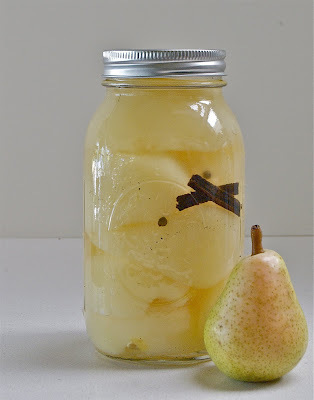 Asian pears need the addition of acid to the jars. If you would like to you can send me a picture of the fruit for me to further inspect. Feel free to email me at nina@putsup.com. I googled and came upon this recipe, and it's just what I'm looking for to make holiday gifts for my relatives. I have a couple of questions, though. How strong is the brandy/peppercorn flavor? I really want to make something a little more special and refined than plain canned pears, but I'm afraid of scaring off some of the people on my gift list with less adventurous palates. One of the other commenters mentioned star anise--would that go well with the brandy and vanilla in lieu of the peppercorns? THanks so much for posting this! I'm glad I stumbled upon your blog. Have you had any problems with discoloring? Love this recipe. Syrup left over may be diluted 1:1 with water and heated in tea mug in microwave. Great morning beverage! Syrup is also good in plain yogurt or added to a fresh fruit salad. I was gifted with what we call Winter pears. They're hard but are great for canning. I'd like to use thus recipe for them. Winter pears sound perfect. I actually use slightly underripe fruit for recipe, mushy fruit should be saves for jam. It's wonderful when the pears have a bit of crisp to them. Does using the Brandy make a huge difference in taste? Worth it? I don't drink very much, especially Brandy, so I don't want to be left with a huge bottle! The Brandy will keep forever and is a great flavor when added to so many dishes and honestly, have you ever had a Brandy Old Fashion, not too shabby. WALL STREET JOURNAL SAYS CANNING IS COOL!